Last night we went out for Jeremy's birthday date night dinner and a movie - his choice. We did the Tacone grill for dinner (mmm! sweet potato fries!) 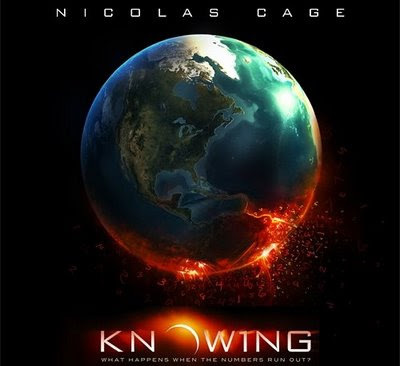 and then the new Nicolas Cage movie "Knowing". Dinner was tasty, as we knew it would be, because we always order the same thing every time we go. Call us creatures of habit, but hey, we know what we like and we stick with it. If you go to the Tacone Grill you MUST try the sandwich called "The United STEAK of America". It's awesome. I love their dipping sauce bar too. It's full of all those trendy new dips like cilantro lime ranch and mango apricot something or other. After a most delicious dinner (and milkshake for the birthday boy) we headed over to the movie theater. I found out on the way over that this particular movie had gotten 2 kinds of reviews from critics. GREAT or AWFUL. Our own newspaper gave it an F! That review alone made me nervous for what we were about to commit to for 2 hours. Now, without giving away too much of the story we will say this: We liked the first 3/4 of the movie just fine. It was full of suspense, mystery, a bit of horror and some seriously good action. (The subway scene was so intense!) The last 15 - 20 minutes were a bit much, but that is what you must expect when watching a sci-fi movie, right? Our final verdict is: RENTAL. But if you are a die-hard sci-fi/action movie lover then get your fanny to the theater and watch this movie! We are more of an action/comedy bunch around here. All in all we give it 3 shiny black rocks out of 5.